Marisol Miranda as Carmen/Tatiana and Socorro Santiago as Ciliana in "Another Word for Beauty" by Jose Rivera, directed by Steve Cosson at Goodman Theatre (January 16 – February 21, 2016). The cast of "Another Word for Beauty" by Jose Rivera, directed by Steve Cosson at Goodman Theatre (January 16 – February 21, 2016). Danaya Esperanza as Luzmery, Carmen Zilles as Isabelle, Zoe Sophia Garcia as Nora, Socorro Santiago as Ciliana, Stephanie Andrea Barron as Yolanda and Helen Cespedes as Xiomara in "Another Word for Beauty" by Jose Rivera, directed by Steve Cosson at Goodman Theatre (January 16 – February 21, 2016). Dan Domingues as Danny/Maurico/Arturo, Danaya Esperanza as Luzmery, Zoe Sophia Garcia as Nora, Carmen Zilles as Isabelle, Stephanie Andrea Barron as Yolanda and Helen Cespedes as Xiomara in "Another Word for Beauty" by Jose Rivera, directed by Steve Cosson at Goodman Theatre (January 16 – February 21, 2016). Heather Velazquez as Maikelyn/Eva/Paramilitary, Stephanie Andrea Barron as Yolanda and Socorro Santiago as Ciliana in "Another Word for Beauty" by Jose Rivera, directed by Steve Cosson at Goodman Theatre (January 16 – February 21, 2016). 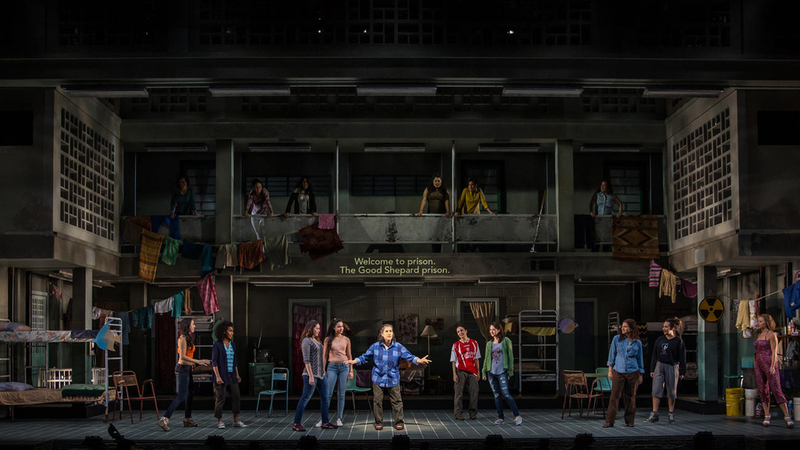 Carmen Zilles as Isabelle, Danaya Esperanza as Luzmery, Helen Cespedes as Xiomara, Stephanie Andrea Barron as Yolanda and Zoe Sophia Garcia as Nora in Another Word for Beauty by José Rivera, directed by Steve Cosson at Goodman Theatre (January 16 – February 21, 2016). Helen Cespedes as Xiomara and Dan Domingues as Danny/Maurico/Arturo in "Another Word for Beauty" by Jose Rivera, directed by Steve Cosson at Goodman Theatre (January 16 – February 21, 2016).